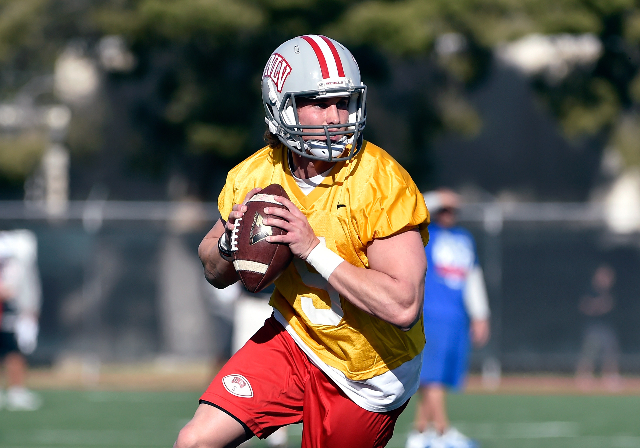 Confidence is something UNLV quarterback Blake Decker has never lacked. But now after a strong end to spring practices followed by an encouraging training camp in August, Decker heads into his senior season with evidence the results can match the belief he has in himself. 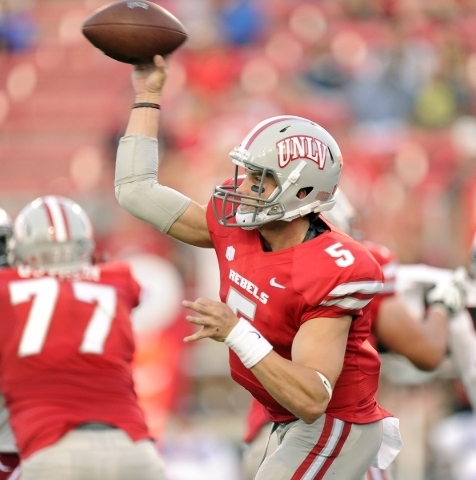 Now it’s a matter of continuing that momentum into the football season, which for UNLV begins at 4:30 p.m. PDT Saturday at Northern Illinois. Decker (6 feet 2 inches, 215 pounds) certainly has ability. He passed for 2,886 yards last season, the third-highest total in school history and the most for a Rebels quarterback since Jon Denton threw for 3,591 in 1996. The issue was Decker’s decision-making, and his 18 interceptions also were the third-highest at UNLV and the most since Bob Stockham was picked off 26 times in 1993. Decker then had to learn a new system under first-year coach Tony Sanchez. He showed in the final week of spring practices that he had picked it up and separated himself from the competition. “I remember back in spring coach Sanchez said he’s not a big believer in gamers,” Decker said. “That’s in reference to guys that show up to practice and they’re inconsistent and think they’ll show up to a game and think they’re just going to turn on the light switch and really have it going. GOLFING WITH THE ENEMY — Sanchez and Northern Illinois’ Rod Carey were paired on the golf course during a coaches summit this spring in Arizona. GOING RETRO — Much has been made about the new uniforms the Rebels will wear this season, and their opponent is breaking out some special duds for Saturday. Northern Illinois will wear 1965 throwback uniforms as part of the tribute to the 50th anniversary of Huskie Stadium. Members of the 1965 team will be at the game. ODDS AND ENDS — Northern Illinois has won all four meetings, including 48-34 last season in Las Vegas. The teams aren’t on future schedules against each other. … This is UNLV’s first opener on a Saturday since losing 41-21 at home to No. 12 Wisconsin in 2010. … The last Rebels coach to win his debut was John Robinson in 1999 at North Texas. UNLV won 26-3. … UNLV has lost five consecutive season openers. 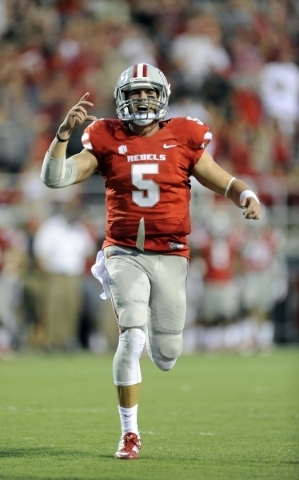 The Rebels’ last opening victory was in 2009, a 38-3 win at home over Sacramento State.